Jim Etscorn is a skilled trial lawyer who has been recognized for his commercial litigation experience and his aggressive defense of product manufacturers and business entities in product liability litigation. Jim has successfully represented clients in complex business litigation involving business torts, breach of contract actions, copyright and trade secret cases, and health care disputes. He is trusted for his sound judgment in advising corporate clients involved in crisis situations and catastrophic matters. Jim’s product liability experience includes the handling of numerous wrongful death cases stemming from product defects, chemical and carbon monoxide exposures, swimming pool entrapments, explosions and cases involving exposure to Legionella. He also helps clients design and implement product warnings, and routinely represents clients before the Consumer Product Safety Commission and the National Highway Traffic Safety Administration in product recall matters. 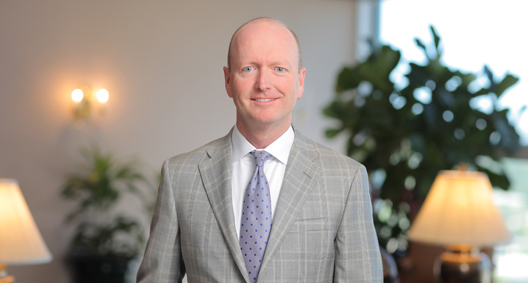 Jim is the managing partner of BakerHostetler's Orlando office, where he is responsible for the management and professional development of more than 100 attorneys and staff. Jim was elected as a member of the American Board of Trial Advocates and has been listed in The Best Lawyers in America© since 2010. He is the former leader of the firm's national Product Liability team, continues to lecture on product liability matters and has presented on the topic of swimming pool accident prevention at the World Aquatic Health Conference. Acted as lead counsel in large, multipatent and breach of contract case, obtaining a jury verdict that resulted in the award of several key patents to the client. Obtained for an IT firm, in a large breach of contract claim worth several million dollars, a defense verdict when the court determined that no breach had occurred during the termination of an IT firm. Obtained defense verdicts for clients in numerous swimming pool wrongful death cases involving suction entrapment. Investigates these cases to determine cause and effect, and advises corporate executives and general counsel on the challenges presented by the cases. Has worked on the development of product warnings designed to prevent such accidents in the future. Represented a hospitality client in a wrongful death case involving a pool accident. Worked with and advised company executives on how to deal with different product liability issues and prevent them in the future. Represented physicians' group against major hospital for breach of contract and wrongful termination of physicians' privileges. The court granted a temporary injunction, finding that the hospital could not terminate privileges simply because it had entered into a competing exclusive contract with another group. Represented theme park in federal court during complex copyright action alleging copyright infringement from a plaintiff seeking several billion dollars in royalties, and obtained a summary judgment on behalf of the theme park. Obtained dismissal of copyright and trade secret case filed in federal court against food processing client. Obtained verdict and attorney's fee judgment for vacation resort developer, resulting in appointment of receiver and replacement of new board of directors. In high-profile case regarding attempted imposition of constructive trust as large tract of land, obtained a directed verdict on behalf of client. Represents clients in the investigation and litigation of carbon monoxide exposure related to the incorrect venting of gas appliances, including heaters. Skilled in accident investigation and determining the origin of carbon monoxide exposure. Litigated cases in several states involving Legionnaire's Disease caused by the exposure and inhalation of inappropriately disinfected water found in fountains, water systems and cruise ships. Has handled product recalls before the Consumer Product Safety Commission (CPSC) and the National Highway Traffic Safety Administration (NHTSA).